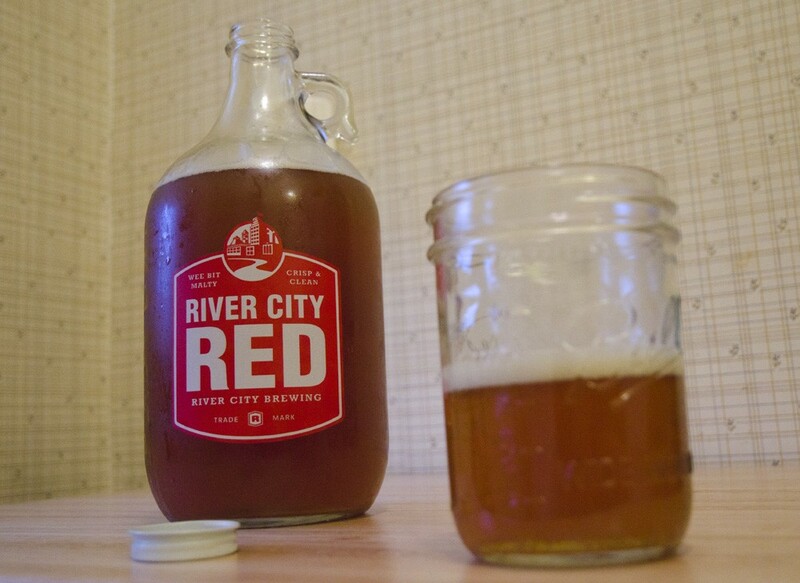 Fresh growler of River City Brewing beer from less than a mile down the road. Compared to some of our other Green Issue assignments — like a day of eating only foods raised within 100 miles or going a full weekend without creating any waste — my mission seemed easy, hardly even a chore. All I had to do was drink beer. Only, the beer had to be brewed locally and without packaging for one weekend, meaning off a tap and out of a reusable container. We love local beers in bottles and cans (both easy to recycle), but for the green issue we wanted minimal waste. Spokane has plenty of local breweries, but my fridge full of 22-oz. specialty and regional beers still proved tempting at times. For some perspective, it's worth taking a moment to consider some of the logistics of shipping beers from across the country or internationally. This piece from the Brewers Association notes most beer shipments consist primarily of water and packaging weight. The hops, malts and other unique ingredients that make up our favorite beers weigh far less. The number-heavy explainer breaks out a lot of the details, but the bottom line is we're burning more than 5.7 million gallons of oil a year to import from Europe. "Because brewers operate in local economies, they could create new jobs where they are needed. Breweries could enjoy greater capacity utilization or faster amortization of their equipment. Local brews would also give the consumer a more fulfilling beer experience because, after all, beer is a perishable food—one that typically gets worse with age." It's an attitude many breweries have championed for years. Sierra Nevada and New Belgium have made sustainability and environmental stewardship high priorities for their operations. Spokane breweries have emphasized local sourcing with some even growing their own hops. Regional wines have changed their bottles to use less material. So we've got a smaller carbon footprint from shipping, combined with additional local jobs and fresher beer. That should be enough, but drinking local beers through bars and tasting rooms also eliminates the waste of packaging. All that tasty beer goes into reusable kegs, growlers or pint glasses. Starting Saturday, I first grabbed a cold pint of Iron Goat Headbutt IPA at the newly opened Wisconsinburger. Over the past two years, many local restaurants have embraced local brews, but it was nice to see this Midwest-centric joint already on top of it. In the afternoon, I made my first visit to Perry Street Brewing. The newly opened neighborhood tap room offered an outstanding selection of beers, including great deals on growler fills. After running through a taster of the six current brews, I enjoyed a Northwest pale and promised to return. At the end of the day, I glared at the off-limits bottles in my refrigerator and decided I would make the leap to a reusable growler on Sunday to take some beer home for the evening. Luckily one of my favorite Spokane breweries is also the closest physically to my home. River City Brewing makes and pours its beers less than a mile from my apartment. An easy walk, especially with a mild buzz. A 64-oz. growler costs $10. A fill costs $12. But the brewery often offers discounts to fill at lower prices to make room for new seasonal beers. They topped me off with a growler of the Heritage English Pale and I headed home. It was all tasty, affordable and about as green as beer gets this side of St. Patrick's Day. So yeah, not a bad assignment. Cheers.